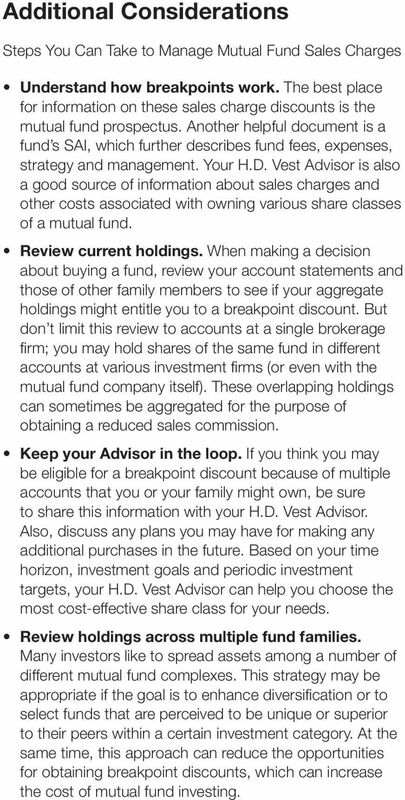 2 A Guide to Mutual Fund Investing at H.D. Vest When you buy shares of a mutual fund from your H.D. Vest Advisor, you may choose from a number of different share classes. And even though these classes represent ownership of the same portfolio offered by the same fund company and managed by the same investment adviser each share class has a different cost structure. To choose the share class that best fits with your financial goals, you need to make some basic assumptions about how much you intend to invest, how long you re likely to hold the shares, and whether you ll be buying more shares in the future. You also need to make sure you understand how the various fees, expenses and charges will affect your investment over time. Once you ve put these concepts in perspective, you can then make an informed decision about choosing a share class that matches your needs, resources and time horizon. 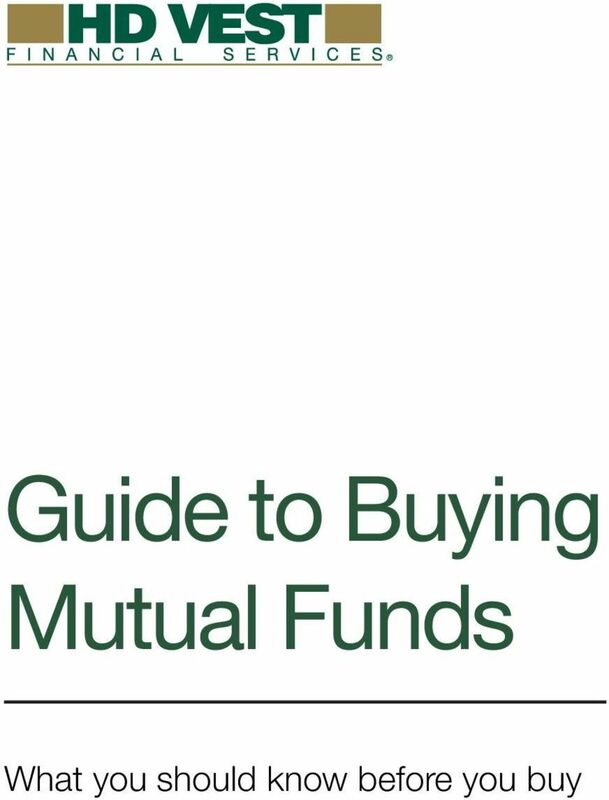 In this guide, we ll present information that may be helpful when it comes to mutual fund investing. You ll find a review of common types of share classes, an explanation of fees and commissions you may be required to pay, plus other information on how to manage fund costs and where you can go to learn more. But remember, before investing in any share class of any fund, you should read the prospectus carefully to learn more about the fund s risks, goals, fees, expenses, strategy and management. Your H.D. Vest Advisor will be happy to send you a prospectus plus other fund information and to provide assistance if you have questions. All payments for the purchase of mutual funds through H.D. Vest should be made by check or ACH transfer payable to a mutual fund company or First Clearing, LLC not to an H.D. Vest Advisor or his/her independent company. When you purchase a mutual fund in a brokerage account through H.D. Vest you will receive a confirmation of the transaction and an account statement referencing H.D. Vest. When you purchase a mutual fund directly from a mutual fund company, you will receive a confirmation and statement directly from that company and not H.D. Vest. If you believe you made an investment through H.D. Vest, but did not receive a confirmation, please call us at (866) , option 2. 3 What is a Mutual Fund? A mutual fund is a type of professionally managed collective investment vehicle that pools the assets of its many investors in a single portfolio for the purpose of investing in diversified holdings. To manage risk, the portfolio manager diversifies the fund s investments according to the fund s investment objective. Funds can invest in a variety of investments, including U.S. or international stocks, bonds, money-market instruments or any combination. Individual investors own shares of the fund, while the fund or investment company owns the underlying investments chosen by the manager. As the number of mutual funds has grown, some mutual funds have become increasingly complex and specialized and may employ complicated investment strategies, such as leverage and short selling, to manage their portfolios. In addition, these complex funds more commonly invest in alternative investments such as commodities, foreign currencies, and derivatives. The level and type of risk associated with mutual funds may therefore vary significantly from one fund to another. As a result, it is important to have a complete understanding of the investment strategies and underlying products from which a mutual fund derives its value in order to evaluate risks. 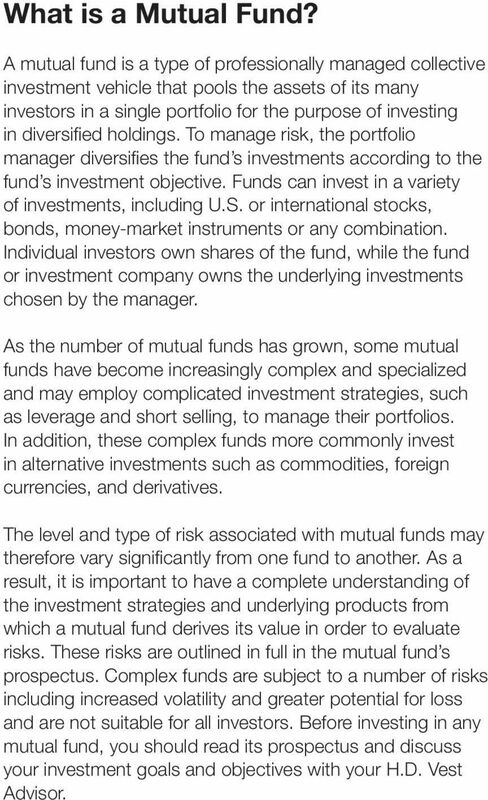 These risks are outlined in full in the mutual fund s prospectus. Complex funds are subject to a number of risks including increased volatility and greater potential for loss and are not suitable for all investors. Before investing in any mutual fund, you should read its prospectus and discuss your investment goals and objectives with your H.D. Vest Advisor. 4 Target-date Mutual Funds A target-date mutual fund (also known as a life-cycle or age-based fund) is designed to provide a simplified investment strategy through a single investment. The goal of these funds is to actively manage the underlying portfolio by focusing on a particular time horizon based on a date in the future (such as 2020, 2030, or 2040), and adjusting the asset mix in the portfolio, the inherent level of risk and the volatility as the target date approaches. Because these funds have an enhanced asset allocation component and are often composed of several individual funds, the expenses are generally higher than traditional funds. Target-date funds generally consist of a blend or bundle of existing mutual funds. This fund-of-funds concept may provide great diversification, but it also may do so at the cost of higher ongoing fees and expenses associated with the underlying investments. The mutual fund manager formulates the investment strategy and approach to risk for each fund. Therefore, the allocation and performance of one fund may be noticeably different than the allocation and performance of another with the same targeted date. If you consider investing in one of these funds, be sure to assess the fund details and make sure that its objectives and holdings are consistent with your risk tolerance and personal investment objectives. Target-date funds should not be selected based solely on age or retirement date. They do not provide a guaranteed return and do not guarantee protection of principal. 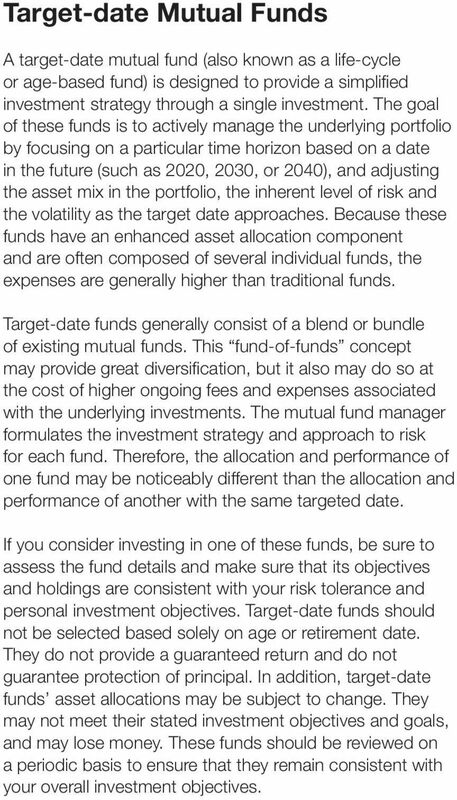 In addition, target-date funds asset allocations may be subject to change. They may not meet their stated investment objectives and goals, and may lose money. These funds should be reviewed on a periodic basis to ensure that they remain consistent with your overall investment objectives. 5 Fixed-Income Mutual Funds Fixed-income funds, also known as bond funds, are a type of mutual fund that invests primarily in a portfolio of bonds or similar debt securities in order to pursue a particular investment objective. Bond funds may invest in a specific type of bond, or a mix of bonds, or investment such as government, municipal, convertible and zero-coupon bonds as well as mortgage-backed securities. Bond funds have unique risks and characteristics, and can lose value especially in periods of rising interest rates. The inverse relationship associated with traditional bond prices and yields also applies to bond funds. When interest rates rise, the bond prices fall and correlated bond fund values may drop as well. The opposite is true as well; if interest rates and bond yields fall, the bond prices could rise. Therefore, the underlying bonds held in a bond fund are subject to liquidity risk, interest rate risk and reinvestment risk, which may be reflected in the bond fund s net asset value (NAV). It is important to note that the fees and expenses of the mutual fund can erode the interest rate and NAV of a bond fund, thus reducing the return to the investor. Bond funds do not have a fixed maturity date. The lack of a fixed maturity date and potential investors demands for redemption are factors that may also have a negative impact on the fund s NAV and share price. The NAV of a bond fund may be affected by a number of factors related to the underlying securities including, but not limited to, credit quality, duration, liquidity, and security structure. Investments in municipal bond funds are subject to the creditworthiness of their issues. Municipal bond funds are subject to the same risks as their underlying municipal securities. Economic issues may impact the performance of the municipal bond issue; as a result principal is at risk or subject to fluctuation. For instance, if the underlying municipality defaults or the security is downgraded, then the value of your portfolio may also decrease. Some single-state municipal bond funds may offer tax benefits, but lack the diversification of a fund that invests in multiple-state issues such as a multi-state or national fund. You should not buy a fixed-income fund based solely on the yield. It is important to consider all risks and characteristics of a bond fund when making your investment decisions. 6 High-Yield and Floating Rate Mutual Funds High-yield and floating rate mutual funds both invest primarily in below-investment-grade securities (sometimes called junk bonds). The securities held within high-yield and floating rate funds are often rated below investment grade by one or more of the nationally recognized statistical rating organizations or may not be rated by a rating agency. These funds take on the risks of the underlying instruments held in the fund portfolio. For instance, the floating rate indicates that the interest rate tied to the underlying instruments will rise and fall, or float, with the variable rate changes and market conditions. These interest rates usually adjust every 30 to 90 days. Investors should take interest rate spreads, credit quality, and collateral into account when considering the fund s portfolio. High-yield and floating rate funds are considered speculative and carry increased risks of price volatility, underlying issuer creditworthiness, illiquidity and the possibility of default in the timely payment of interest and principal, which may impact the value of your portfolio. These funds do not maintain a stable NAV and should not be considered cash alternative funds. You can lose money in these funds. Unlike money market funds the investment objective is not to maintain a stable NAV. Complex Mutual Funds Some mutual funds employ complex and specialized investment strategies. These funds commonly invest in alternative investments such as commodities, foreign currencies, and derivatives, and may employ a flexible approach to invest widely across asset classes and use complicated and aggressive investment strategies such as leveraging and short selling to manage their portfolios. The level and type of risk associated with complex mutual funds may vary significantly from one fund to another. It is important to have a broad understanding of the investment strategies and underlying products from which a complex mutual fund derives its value in order to evaluate its risks. Complex funds are subject to a number of risks including increased volatility and greater potential for loss and are not suitable for all investors. 7 Alternative Mutual Funds Are Not Your Typical Mutual Funds Alternative mutual funds typically employ complex investment strategies by holding more non-traditional investments. This approach differs from the buy-and-hold strategy typical in the mutual fund industry. For example, Alternative mutual funds might invest in assets such as global real estate, commodities, leveraged loans, startup companies and unlisted securities that offer exposure beyond traditional stocks, bonds and cash. The variety of investment strategies employed by alternative mutual funds causes each fund to have unique characteristics and risks. Alternative mutual funds are subject to a number of risks including increased volatility and greater potential for loss and are not suitable for all investors. The Financial Industry Regulatory Authority (FINRA) issued an Investor Alert called Alternative Funds Are Not Your Typical Mutual Funds to inform investors to consider the characteristics and potential risks in investing in alternative mutual funds. To learn more about alternative mutual funds, visit the following website: InvestorAlerts/MutualFunds/P Money Market Mutual Funds A money market fund is an open-end mutual fund that is required to invest in low-risk, short-term securities, which may include municipal securities. Money market funds are generally liquid due to the short-term nature of their underlying investments and are typically used by investors who have a low risk tolerance. Investors interested in a conservative alternative for their discretionary money may find that money market mutual funds may allow for preservation of capital, liquidity and return on principal. History, however, has shown that investing in money market funds is not without risk. Typically, money market funds try to keep their NAV at a constant $1 per share. This stability and per-share NAV is implied, but not guaranteed. Cash sweep programs utilizing money market funds allow your otherwise uninvested cash holdings to sweep automatically from your brokerage account into a money market fund sweep program that offers SIPC insurance. 1 These sweep options are generally considered lower risk and are liquid in nature, giving investors the ability to potentially earn a return on cash holdings or funds being set aside for a future purchase. 1 SIPC does not ensure the quality of investments or protect against losses from fluctuating market value. 8 An investment in a money market fund or a cash sweep program differs from having a traditional bank deposit money market account and is not insured by the FDIC. Similar to bond funds, money market funds and sweep program options carry fund operating expenses not associated with an individual fund and are subject to the risks discussed above as well as manager risk. Before investing in any money market fund or cash sweep program, you should discuss your investment goals and objectives with your H.D. Vest Advisor and understand the features, characteristics, risks and costs associated with the investment vehicle. For more information on money market mutual funds and cash sweep programs, contact your H.D. Vest Advisor. Costs of Investing in Mutual Funds In addition to including information about a fund s objectives, risks and other characteristics, a fund s prospectus also includes a fee table listing the charges you pay, which include sales charges and annual operating expenses. You can pay these charges in a variety of ways, depending on the share class you choose. We also describe fee-based accounts and mutual fund switches later in this document. Sales Charges These charges provide compensation for the fund company, H.D. Vest and your H.D. Vest Advisor, who helps you select funds to pursue your investment objectives. Most sales charges are either front-end (charged when you buy shares) or back-end (charged when you sell). A back-end charge is also called a contingent deferred sales charge (CDSC), because if you hold your shares for longer periods of time the charge is reduced or eliminated. Operating Expenses Many of the costs associated with running a mutual fund are operating expenses or, simply put, the cost of doing business. Included in fund operating expenses are management fees, 12b-1 fees, shareholder mailings and other expenses. Operating expenses are not paid directly as a fee, but they are deducted from the fund s assets, so they reduce investment returns. It is important to note that, generally, non-traditional mutual funds incur higher overall expenses due to periodic rebalancing and the use of complex investment strategies. The fund s prospectus will note the fund s expense ratio (a measure of what it costs an investment company to operate a mutual fund, expressed as a percentage of the fund s net assets), which helps you compare the annual expenses of various funds. The fund company takes 12b-1 fees out of the fund s assets each year for marketing and distribution expenses, which may include compensating H.D. Vest Advisors or other investment professionals. 9 Redemption Fees A short-term redemption fee may be charged when shareholders redeem their mutual fund shares early. This fee may be charged regardless of the initial sales charge paid. Redemption fees are designed to discourage frequent trading in mutual funds and to offset the costs associated with those trades. These fees are paid directly to the mutual fund company and not to the H.D. Vest Advisor. Each fund s rules about short-term redemption are different. It is important to check the mutual fund s prospectus for the specific redemption period and schedule of fees. Getting Started with Share Classes Many mutual fund families offer three different share classes for a given mutual fund: class A, class B and class C shares. Although there are many other share classes such as classes T, I and R, most mutual funds generally fall into one of the first three mentioned above. The main difference in the share classes is the varying sales charges, distribution fees and management fees associated with each share class. Your H.D. Vest Advisor will be compensated differently depending on the share class you choose. 2 See the How Compensation is Paid to H.D. Vest and Your Advisor section. When deciding which share class to buy, you should consider the following questions: How long do I plan to hold the fund? How much money do I intend to invest? Will I be purchasing more shares in the future? What expenses will I pay for each class? Do I qualify for any sales charge discounts? Talking with your H.D. Vest Advisor about these questions will help you make an informed decision when determining which share class(es) match your needs, resources, and time horizon. 2 This discussion of share classes and the associated sales charges relates primarily to commission-based brokerage accounts. In a fee-based account, you pay an ongoing fee based on the value of the assets in the account, and do not pay loads or sales charges on individual transactions. However, other fees and payments discussed below may still be paid to H.D. Vest and/or your H.D. Vest Advisor. 11 Sample Breakpoint Schedule Class A Shares This table is offered for illustrative purposes only. Actual breakpoints, if offered, will vary for different funds and fund families. Note that many fund families do not offer breakpoint discounts for purchases of less than $50,000. Investment Amount Sales Load Less than $25, % $25,001 or more but less than $50, % $50,001 or more but less than $100, % $100,001 or more but less than $250, % $250,001 or more but less than $500, % $500,001 or more but less than $1 million 2.00% $1 million or more 0.00% Even if you don t invest the minimum amount necessary to reach a breakpoint threshold, there are several ways to take advantage of reduced sales charges. Commonly offered by most brokerage firms and mutual fund companies, these opportunities are called Rights of Accumulation and Letters of Intent. While some fund families may consider only class A shares when calculating a breakpoint, other fund families also include class B and class C shares in the equation. Also, assets you have within the same fund family held at other brokerage firms can be considered for breakpoints. Rights of Accumulation A Right of Accumulation is an agreement that allows you to combine class A shares you already own with additional class A share purchases in the same fund family for the purpose of achieving breakpoints or other associated discounts. For example, if you already hold $80,000 worth of class A shares of a given fund and you buy an additional $20,000 of class A shares, the fund company may allow you to combine those investments to reach a $100,000 breakpoint. This may entitle you to a considerably lower sales charge on your $20,000 purchase. 12 Letters of Intent A Letter of Intent is an agreement you make with a fund company to invest a certain amount within a given period of time, and thus, you become eligible for breakpoints. When assessing sales charges, many fund companies allow you to include purchases completed within 90 days before the Letter of Intent is signed and within 13 months after the agreement commences. Investors should always read the prospectus carefully for more details. If you expect to invest on a regular basis or make additional investments during the next 13 months, a Letter of Intent is worth considering because it can help you qualify for reduced sales charges for purchases made prior to reaching the breakpoint. But make sure you have the resources and commitment to invest the stated amount within the agreed-upon time frame; if not, the fund company may retroactively collect the higher sales charge. Discounts for Families or Owners of Multiple Accounts Another way to become eligible for sales load discounts is to combine the accounts of multiple members of a given family. Most fund companies will permit you to take advantage of breakpoints if you aggregate your fund purchases with those of your spouse or dependent children. You may also be able to reach discount thresholds if you aggregate mutual fund purchases across multiple accounts, such as certain retirement accounts, educational savings accounts or accounts at other brokerage firms. In some cases, employer-sponsored retirement or savings plan accounts may be combined as well. Details and eligibility vary from one fund family to another. Please read the prospectus or Statement of Additional Information (SAI) available from your H.D. Vest Advisor for more details. Ongoing Fees and Expenses A mutual fund deducts fees from its total assets to cover various day-to-day services, including portfolio management and administration. These and certain other fees and costs are generally referred to as a fund s expense ratio, which is described in detail in a fund s prospectus. Similarly, 12b-1 fees may be deducted from a mutual fund s assets to cover certain costs associated with marketing and distributing the fund to investors. Because 12b-1 fees are paid out of fund assets, they increase the expenses the investor pays as a fund shareholder. The investor does not pay these fees directly. They are deducted from the total assets in the fund and therefore reduce investment returns. The amount of the 12b-1 fee is determined by the mutual fund company and is set forth in the mutual fund s prospectus and/or Statement of Additional Information. Depending on the share class, these fees can range from 0.25% to 1% or $25 to $100 annually for every $10,000 investment. Generally, the 12b-1 fee in class A shares averages 0.25% or $25 in annual expenses on a $10,000 investment. 13 Class B Shares If you purchase class B shares, you will not pay a front-end sales charge in most cases. However, you will be required to pay what is known as a contingent-deferred sales charge (CDSC) if you sell your shares within a certain period of time (typically five to nine years). In addition, class B shares are generally subject to higher 12b-1 fees, which result in higher ongoing expenses than class A shares. For example, a 12b- 1 fee in class B shares can range from 0.75% to 1% or $75 to $100 in annual expenses for every $10,000 invested. The CDSC associated with class B shares gets smaller over time and expires at the end of the designated period. Also, the higher annual fees will diminish investment returns over time. At that time, or shortly thereafter, most class B shares convert into class A shares. When this happens, your investment will become subject to the same expenses as class A shares. Sample CDSC Schedule Class B Shares This table is offered for illustrative purposes only. Actual sales charges will vary for different funds and fund families. Years Since Purchase Contingent-Deferred Sales Charge (CDSC) % % % % % % % % Even though you won t pay a front-end sales load for class B shares, the higher annual fees will diminish investment returns over time. Because of the CDSC, you should probably not choose this share class if you intend to sell your shares within a relatively short period. 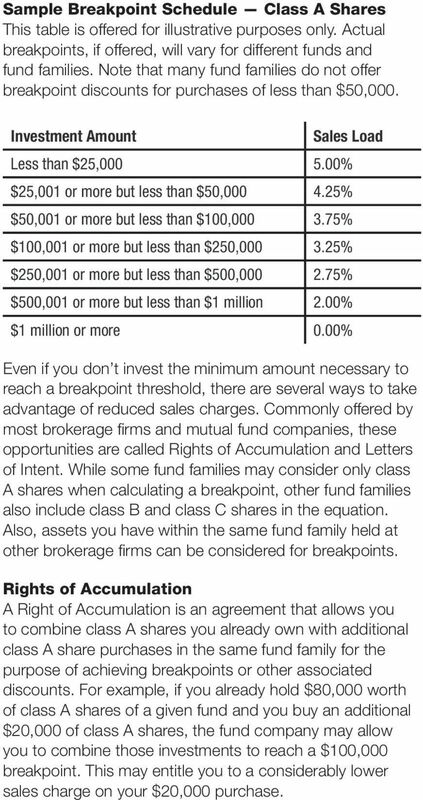 And remember, purchasers of class B shares aren t usually eligible for breakpoints. If you intend to invest in class B shares, you should consult with your H.D. Vest Advisor to determine whether an investment in class A shares might make more sense due to the availability of breakpoints or other sales charge discounts. It is also important to know that H.D. Vest and your H.D. Vest Advisor receive compensation on the purchase of class B shares even if you did not pay an up-front sales load, and, depending on a number of factors, this compensation may be greater than what we would have received had you purchased class A shares. 14 Class C Shares For class C shares, mutual fund companies typically charge a constant load structure throughout the life of the fund investment. If you purchase class C shares, you may or may not pay a front-end sales charge. The CDSC associated with class C shares tends to be relatively small (generally 1%, for example), and it generally expires within a year. However, class C shares usually impose higher annual fund-operating expenses. These fees continue as long as you hold your shares. Since higher expenses will reduce investment performance, it may be more expensive to own class C shares versus class A shares or class B shares if you intend to maintain your investment for a long holding period. Expenses in class C shares typically range from 0.9% to 1.1%. For example, for every $10,000 investment in class C shares, the annual expenses would be $90 to $110. Since higher expenses can reduce investment performance, class C shares should probably not be considered unless you have a relatively short investment horizon and do not qualify for breakpoints or other sales charge discounts. Finally, even though you may not have paid an up-front commission on the purchase of class C shares, H.D. Vest and your H.D. Vest Advisor will receive a commission. Class I Shares Class I shares are an institutional share class that are typically sold without a sales charge and offer lower annual costs and management expenses than traditional share classes like A, B and C shares. Furthermore, class I shares generally do not feature a CDSC for the sale of your shares. As a result of these lower costs and expenses, class I shares are typically offered at a much higher minimum investment amount than class A, B or C shares. Fund companies frequently restrict an investor s ability to purchase or hold class I shares outside of a fee-based account. Please review the fund s prospectus for more information. No-Load Mutual Funds No-load mutual funds do not charge a front-end sales charge or a deferred sales charge, such as a CDSC; however, they do impose ongoing fees and expenses. These fees and expenses are described in the fee table in the prospectus. 15 Fund-of-Funds Some mutual funds invest in the shares of other mutual funds. Such funds are called fund-of-funds. While the up-front sales charge and ongoing fees and expenses for fund-of-funds may appear to be lower than mutual funds that hold securities directly, keep in mind that investors also pay all of the ongoing fees and expenses associated with the underlying mutual funds in the fund-of-funds portfolio. These fees generally are not shown in the fund-of-funds prospectus, but can be determined by reviewing the mutual fund holdings for the fund-of-funds you are interested in or by asking your H.D. Vest Advisor. To compare expenses by share class, you may wish to review FINRA s Expense Analyzer: This calculator is not available for offshore funds. Fee-Based Accounts Investors can also buy funds through various fee-based accounts. 3 Instead of paying a sales charge or commission on each transaction, you pay an annual fee, billed quarterly in advance, based on a percentage of the account s value. Annual fund operating expenses still apply. These programs offer funds as either no-load shares or class A shares where the sales charge is waived. In some instances, both class A and I shares are available for the same fund. These programs and accounts provide benefits and features that may not be available in a traditional H.D. Vest brokerage account. Therefore, the total cost of purchasing and holding a fund in these programs may be more than in a traditional brokerage account. Fee-based programs are not designed for excessively traded or inactive accounts and may not be suitable for all investors. 3 Please review H.D. Vest s disclosure documents for a full description of the firm s investment advisory services, including fees and expenses. A copy of the Investment Adviser s ADV Part II is available on request. In certain instances, where available, class I shares may also be used. Fee-based accounts may impose additional fees on securities not eligible for this fee structure. 16 Mutual Fund Switches As your objectives change, you can switch your assets among the mutual funds in the same mutual fund family whose objectives most closely meet your needs, without incurring an additional sales charge. Staying within the same mutual fund group may be preferable, since switching from one mutual fund group to another may involve additional costs or fees. On the other hand, there can be other considerations for switching to a mutual fund in another mutual fund group, or another type of investment product such as an annuity or Unit Investment Trust (UIT). For example, in circumstances where the one mutual fund group you invest in does not offer a type of mutual fund to switch to that is most aligned with your investment objectives. If you do choose to switch to a mutual fund in a different mutual fund group or to another type of investment, and your account is commission based, you will most likely incur a sales charge on the new investment. 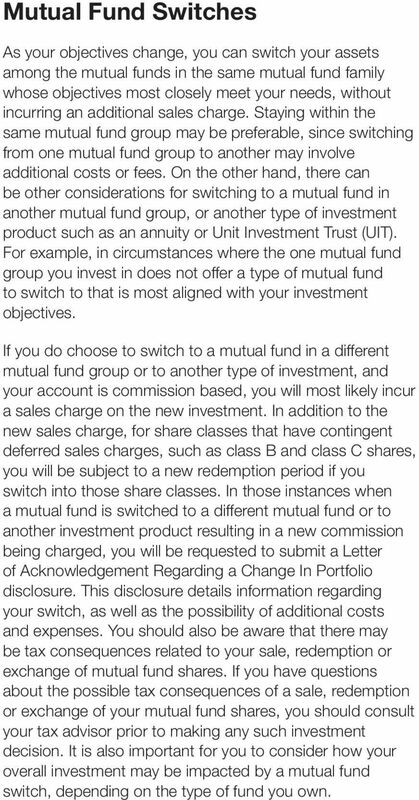 In addition to the new sales charge, for share classes that have contingent deferred sales charges, such as class B and class C shares, you will be subject to a new redemption period if you switch into those share classes. In those instances when a mutual fund is switched to a different mutual fund or to another investment product resulting in a new commission being charged, you will be requested to submit a Letter of Acknowledgement Regarding a Change In Portfolio disclosure. This disclosure details information regarding your switch, as well as the possibility of additional costs and expenses. You should also be aware that there may be tax consequences related to your sale, redemption or exchange of mutual fund shares. If you have questions about the possible tax consequences of a sale, redemption or exchange of your mutual fund shares, you should consult your tax advisor prior to making any such investment decision. It is also important for you to consider how your overall investment may be impacted by a mutual fund switch, depending on the type of fund you own. 17 Additional Considerations Steps You Can Take to Manage Mutual Fund Sales Charges Understand how breakpoints work. The best place for information on these sales charge discounts is the mutual fund prospectus. Another helpful document is a fund s SAI, which further describes fund fees, expenses, strategy and management. Your H.D. Vest Advisor is also a good source of information about sales charges and other costs associated with owning various share classes of a mutual fund. Review current holdings. When making a decision about buying a fund, review your account statements and those of other family members to see if your aggregate holdings might entitle you to a breakpoint discount. But don t limit this review to accounts at a single brokerage firm; you may hold shares of the same fund in different accounts at various investment firms (or even with the mutual fund company itself). These overlapping holdings can sometimes be aggregated for the purpose of obtaining a reduced sales commission. Keep your Advisor in the loop. If you think you may be eligible for a breakpoint discount because of multiple accounts that you or your family might own, be sure to share this information with your H.D. Vest Advisor. Also, discuss any plans you may have for making any additional purchases in the future. Based on your time horizon, investment goals and periodic investment targets, your H.D. Vest Advisor can help you choose the most cost-effective share class for your needs. Review holdings across multiple fund families. Many investors like to spread assets among a number of different mutual fund complexes. This strategy may be appropriate if the goal is to enhance diversification or to select funds that are perceived to be unique or superior to their peers within a certain investment category. At the same time, this approach can reduce the opportunities for obtaining breakpoint discounts, which can increase the cost of mutual fund investing. 18 Risks Mutual funds are generally actively managed. Fund managers may purchase or sell securities in the fund portfolio in an attempt to take advantage of changing market conditions. It is possible for a mutual fund to hold securities, even though their market value and dividend yields may have changed. A mutual fund may carry the same investment risk as the securities within the fund. Securities in a fund portfolio may depreciate, and the fund may not achieve its intended objective. In addition, each mutual fund is subject to specific risks that vary depending on the fund s investment objectives and portfolio composition. Each type of mutual fund offers unique risks and characteristics. Please refer to each fund s prospectus for additional details. Selecting What s Right for You Selecting the appropriate program and mutual funds for your investment objectives involves a number of factors: fund strategies, fund performance history, risks, investment time horizon, fees and expenses, portability, etc. You should review any program s disclosure document as well as a fund s share classes, as detailed in the fund prospectus, to fully evaluate your options. In addition, it is important that you be aware that certain mutual funds may not be transferable from one investment firm to another. As a result, if you or your H.D. Vest Advisor changes investment firms, you may need to choose to liquidate these products, which may incur additional fees or tax consequences. In some instances it may be prudent to leave these mutual funds that cannot be held at the previous firm. It is important to remember that you are not required to sell such mutual funds when you or your H.D. Vest Advisor changes firms. You can open an account with the new firm and transfer only the mutual funds you wish to move. It is not required that you move everything in your previous account or liquidate mutual funds that are not transferable. In order to make the decision that is most appropriate for your financial situation, you should also talk with your H.D. Vest Advisor so that together you can make the choices most suitable for you. 19 How Compensation is Paid to H.D. Vest and Your Advisor For helping you choose mutual funds, H.D. Vest and your H.D. Vest Advisor are paid in ways that vary with the type of fund (equity or fixed income), the amount invested and the share class. As mentioned above, H.D. Vest is paid by the fund family from the fees you pay. Part of that payment then goes to your H.D. Vest Advisor. For most purchases, H.D. 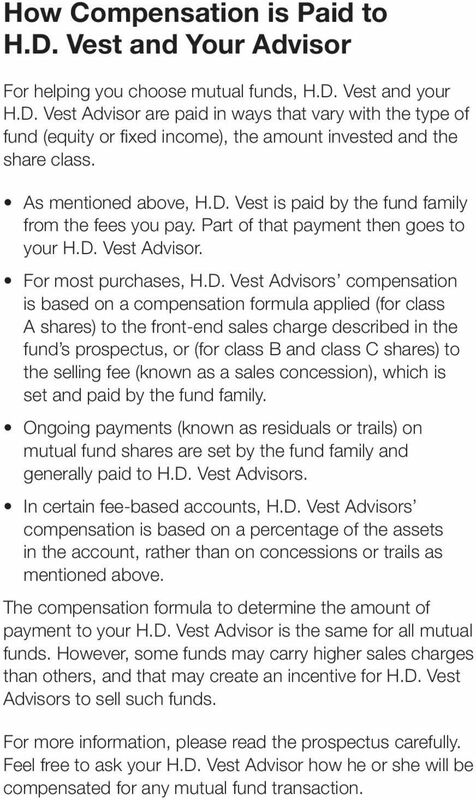 Vest Advisors compensation is based on a compensation formula applied (for class A shares) to the front-end sales charge described in the fund s prospectus, or (for class B and class C shares) to the selling fee (known as a sales concession), which is set and paid by the fund family. Ongoing payments (known as residuals or trails) on mutual fund shares are set by the fund family and generally paid to H.D. Vest Advisors. In certain fee-based accounts, H.D. Vest Advisors compensation is based on a percentage of the assets in the account, rather than on concessions or trails as mentioned above. The compensation formula to determine the amount of payment to your H.D. Vest Advisor is the same for all mutual funds. However, some funds may carry higher sales charges than others, and that may create an incentive for H.D. Vest Advisors to sell such funds. For more information, please read the prospectus carefully. Feel free to ask your H.D. Vest Advisor how he or she will be compensated for any mutual fund transaction. 20 Additional Compensation Received by H.D. Vest from Mutual Fund Companies In addition to the transaction-based commissions received by H.D. Vest and your H.D. Vest Advisor, H.D. Vest also receives additional compensation from mutual fund companies that is not related to individual transactions but instead is paid by the fund companies for the ongoing account maintenance, marketing support and education and training services performed by H.D. Vest in support of mutual fund sales. This non-commission compensation received by H.D. Vest from fund companies can be broken down into four general categories: Networking services compensation; Marketing support (also known as revenue-sharing ); Training and education support; and Other compensation for general services provided to funds. While these compensation arrangements are described in varying levels of detail in the prospectus and SAI for each mutual fund offered by H.D. Vest, this section is intended to provide you with enhanced disclosure about the compensation arrangements between H.D. Vest and mutual fund companies as well as the associated potential conflicts of interest. Network Fees Network fees are designed to compensate H.D. Vest for providing varying degrees of customer account and administrative services for those H.D. Vest customer accounts holding mutual funds. These services include, for example: the processing of purchases, redemptions and exchanges; check processing; dividend reinvestments; preparation and mailing of consolidated account statements; delivery of fund proxies and reports; tax reporting; maintaining ownership records; and other subaccounting and record-keeping services. Compensation paid for networking services are negotiated from fund company to fund company and vary depending on the networking services that H.D. Vest is required to perform for each client account established with a fund. If a client owns multiple funds in one fund family, H.D. Vest generally receives networking compensation for each individual fund. H.D. Vest may receive networking compensation based on a dollar amount per year, per client account with an individual fund or based on a percentage of assets in a fund. Networking compensation is paid at a rate of up to $6 per year per client account. 21 Marketing Support Compensation Marketing support compensation, also known as revenuesharing is compensation paid to H.D. Vest for providing ongoing day-to-day marketing and sales support to its Advisors and clients with respect to mutual fund companies and their funds. A select group of companies (Educational Partners) have agreements with H.D. Vest to provide payment to help defray the educational, training, recordkeeping and other costs associated with offering these products to clients. Revenue-sharing fees are usually paid by the fund s investment adviser, or an affiliate, as a percentage of H.D. Vest s aggregated value of client assets invested in the funds. In certain instances, revenue sharing payments, in addition to the fees and expenses disclosed in the fund prospectus fee table, may be paid as a percentage of annual new sales to clients, or as a combination of a percentage of new sales and a percentage of aggregate client assets. The percentage amounts are typically established in terms of basis points, which are equal to one one-hundredth of one percent. The amount paid by Educational Partners can be up to 0.20% on assets under management and 0.10% to 0.35% on sales. So for example, if H.D. Vest receives 10 basis points in revenuesharing for a given fund, it would receive $10 for each $10,000 of total assets in client accounts in the fund. H.D. Vest receives different revenue-sharing rates from fund family to fund family, and may receive different revenuesharing rates for certain funds within a particular fund family. Fund companies pay H.D. Vest revenue-sharing compensation at an annual rate of up to 20 basis points on aggregate client assets (on a $10,000 client position, 20 basis points amounts to $20 per year) as long as the assets stay invested. However, certain funds may pay H.D. Vest a negotiated fixed annual amount for revenue-sharing regardless of the amount of assets held in client accounts or new sales to clients. H.D. Vest may also receive additional lump sum payments from Educational Partners, which could be significant in amount. In addition to receiving revenue in connection with the sale of mutual funds, H.D. Vest receives revenue-sharing in connection with the sale of variable annuities. 22 Training and Education Compensation Training and education compensation is paid by mutual fund companies to offset or reimburse H.D. Vest for costs incurred in conducting comprehensive training and education meetings for H.D. Vest Advisors. These meetings or events are designed to provide comprehensive advisor training and education with respect to product characteristics, sales materials, customer support services and successful sales techniques. Likewise, from time to time, product sponsors will reimburse H.D. Vest for expenses of individual branch offices incurred in connection with conducting training and educational meetings, conferences or seminars for H.D. Vest Advisors and customers. Also, H.D. Vest Advisors may receive promotional items, meals or entertainment or other noncash compensation from product sponsors. While training and education compensation is not related to individual transactions or assets held in client accounts, it is important to understand that due to the total number of product sponsors whose products are offered by H.D. Vest, it is not possible for all mutual fund companies to participate in a single meeting or event. Consequently, those product sponsors that participate in a training or educational meeting, seminar or other event gain an opportunity to build relationships with H.D. Vest Advisors that could lead to additional sales of the fund company s products. Potential Conflicts of Interest Associated with Additional Compensation Arrangements It is important for clients to understand that compensation received for networking services, revenue-sharing, training and education, and other services varies from fund family to fund family, and even from fund to fund within a particular family. Accordingly, a potential conflict of interest exists where H.D. Vest receives more compensation from one fund family (or from one fund) than is received from peer fund families (or from peer funds). 23 H.D. Vest has adopted policies reasonably designed to control and limit these potential conflicts of interest. These include, but are not limited to, policies that: Require networking and revenue-sharing agreements to be in writing and prohibit agreements or provisions that call for H.D. Vest to provide preferential marketing and promotional treatment to a fund family as a condition of paying or receiving networking or revenue-sharing fees. Prohibit the sharing of any portion of networking or revenue-sharing fees with Advisors. Require the mutual fund distributor or Advisor to directly compensate H.D. Vest for revenue-sharing by wire transfer or check, and prohibit funds and their portfolio managers from directing investment portfolio trades to H.D. Vest as indirect compensation for revenue-sharing. Require reimbursement payments for general educational and training expenses and for expenses associated with conducting individual branch office training and education activities to be recorded and approved. Limit the annual dollar value of gifts or other noncash items that mutual fund companies and their representatives can provide to H.D. Vest Advisors. Additionally, to help increase transparency concerning these compensation relationships, those fund families that pay H.D. Vest networking, and/or revenue-sharing compensation are listed in the Mutual Fund table. In addition to those funds identified in the table, it is important for you to understand that nearly every fund that is sold by H.D. Vest provides some degree of educational, training or other non-cash compensation to H.D. Vest and H.D. Vest Advisors. If you attend training or educational meetings with your H.D. Vest Advisor and a representative of a mutual fund is in attendance, you should assume that the mutual fund has paid or reimbursed H.D. Vest for part of the total costs of the meeting or event. H.D. Vest offers a wide variety of fund families for H.D. Vest Advisors to sell or recommend, including funds that do not compensate H.D. Vest for one or all of the services above.